The New York Times Editorial Board: Should towns up and down the Hudson River be rest stops on a mulitilane highway for barges carrying crude oil? Absolutely, say the shipping and tugboat interests. But if you care about the health and vitality of the beleaguered Hudson — more than the convenience and efficiency of the industries behind America’s energy boom — the answer should be no, absolutely not. Acting on a request from the Maritime Association of the Port of New York and New Jersey, the Hudson River Port Pilot’s Association and the American Waterways Operators, the Coast Guard is considering creating 10 anchorage sites for barges between Yonkers and Kingston. These sites would provide space for a total of 43 berths for vessels traveling between the Port of Albany and New York Harbor. Why now, on a river that has been a commercial thoroughfare for centuries? It’s supposedly a matter of safety. 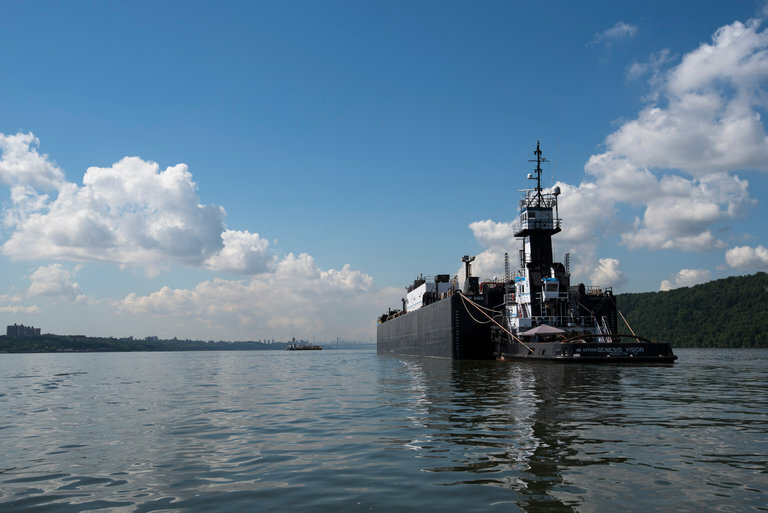 There is now only one federally designated anchorage site along the 109 nautical miles between Yonkers and Albany, and the shippers say that when storms and fogs roll in, the barges need more places to stop. But what they are asking of the Coast Guard reflects something new and troubling along the river. It’s one more manifestation of the huge challenges and dangers of moving petroleum from the fracking grounds of North Dakota to points across the country, by rail, pipeline, barge and truck. River traffic is up, the Albany port is booming and the fragile Hudson, many fear, will inevitably become — like streams and farmlands in North Dakota — an environmental casualty of the oil boom. Spills are inevitable, they fear. Anchors will damage the riverbed.It’s not just the riverfront aesthetes who wilt at the thought of hulking iron vessels blocking their cherished water views — although having 16 barges anchored off Yonkers day and night might make that funky river town suddenly feel a lot more like a floodlit Galveston, Tex. The bigger problem is that communities on the Hudson know the long, painful history of federal meddling and complaisance that for generations has put the convenience and profits of industry ahead of sanity. The river is beautiful, but it is still sick, a victim of misbegotten power plants and factories, municipal waste, toxic dumping and government neglect. A nuclear plant’s cooling system kills fish by the millions. General Electric stained miles of the riverbed with PCB’s, and the damage will be linger for decades to come. The river once had a commercial fishery, but pollution of all kinds took care of that. Now comes the North Dakota oil. The Coast Guard is accepting public comment through December. Communities on the river are raising a stink. They should, for the most basic reason: oil and water. Read more.